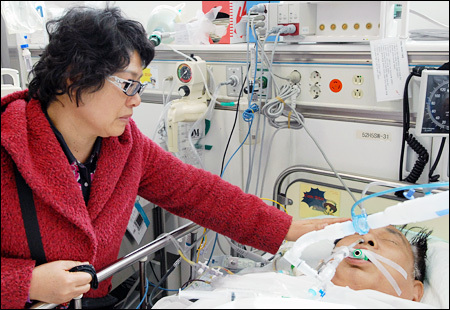 Choi Jin-hee, wife of wounded Captain Seok Hae-kyun of the 11,500-ton chemical carrier Samho Jewelry, touches her husband’s forehead in the intensive care unit at Ajou University Hospital in Suwon, south of Seoul, Sunday. Seok, who had several gunshot wounds in his body, underwent surgery after being flown to Korea from Oman. The wounded captain of a South Korean freighter freed from Somali pirates remained in critical, but stable condition, following an additional operation in a hospital in Suwon, Gyeonggi Province, doctors said Sunday. Captain Seok Hae-kyun, 58, was flown home on a medevac jet Saturday night from Sultan Qaboos Hospital in Salalah, Oman for further surgery here. Yoo said Seok suffered from septicemia with disseminated intravascular coagulation, but his condition had not got worse some 12 hours after the surgery. Septicemia is a potentially life-threatening infection of the blood that progresses rapidly. “During the three-hour operation, we removed tissues that appear to have been affected by septicemia,”he said, adding that Seok’s vital organs remained stable. Seok suffered multiple gunshot wounds during the rescue operation and underwent surgery immediately after being transferred to the Omani hospital on Jan. 21. The chief doctor said six wounds were found in Seok’s body, but could not confirm how many bullets were shot at him. He noted that doctors in Oman removed two bullets during the previous operations, while two additional bullets were removed from his legs in the latest surgery. Yoo, however, declined to comment what types of bullets were found. “We will make plans for further surgery after administering antibiotics to prevent infections in areas operated on, and observing his condition,” he said. Yoo said Seok still has a high fever due to the severity of his infection and could be vulnerable to pneumonia. The hospital has about 20 staff members on 24-hour standby to tend to the wounded captain. Doctors at the hospital say they have removed dead muscle, tissue and a large amount of pus from his body. The captain is also known to be suffering from a ruptured liver and large intestine, as well as open fractures of the left wrist, left thigh and right knee. His family — wife Choi Jin-hee, 58, and second-son Hyeon-soo, 30 — arrived from Oman to rejoin him at his beside in the intensive care unit. Seok was the only one wounded among the 21-member crew of the 11,500-ton chemical carrier Samho Jewelry, which was hijacked by Somali pirates in the Indian Ocean on Jan. 15. Seok was shot several times by pirates during a dramatic rescue mission, in which South Korean Navy commandos killed eight Somali pirates and captured the remaining five. He is credited with helping the rescue operation go successfully. Despite constant threats by the armed pirates, the captain slowed his vessel from moving toward the Somali coast by mixing water in the engine oil, as well as steering the carrier in a zigzag path or sometimes backtracking.